The use of a bow and arrow is so deeply ingrained into the British culture that there can be few people who are not familiar with archery. Nowadays we don’t have to go out and hunt our own food, nor do we have much call for a bow when fighting our enemies. So archery has now become a sport, rather than a key part of our day to day lives. It has been a permanent Olympic sport since 1972. Archery is extremely popular in the UK and the country has hundreds of archery clubs. This means there’s one within easy reach of all but the most remote locations. The principle governing body for the sport of archery is the Grand National Archery Society and the Society serves the nine regional archery societies. The GNAS oversees archery clubs all over Great Britain and Northern Ireland. It sets the rules for competitions as well as helping to ensure the safety of the archers themselves and spectators at exhibitions and competitions. The GNAS organises various tournaments and competitions at both a local and national level. 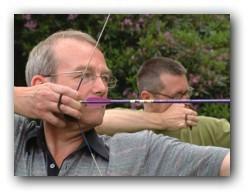 The GNAS also recognises crossbow archery as a sport. The great majority of archers today, however, choose to shoot the recurve bow. A composite bow using hi-tech materials and technology, the recurve bow is the modern equivalent of the famous longbow used to defeat the French at the famous Battle of Agincourt on October 25, 1415.